Most dogs will chew and swallow almost anything, especially when they’re puppies. And although some objects may be small enough to swallow and digested with minor consequences, others may get stuck at some point – in the mouth, throat, esophagus, stomach, or intestines. Any sudden onset of choking that affects respiration should be dealt with urgently. Signs of intestinal or digestive discomfort (typically in the form of vomiting and possibly diarrhea) will require investigation – often by verifying what toys and items are still present and deducing what may have been swallowed along with more specific veterinary means of deduction. f the dog is choking and in respiratory distress, act quickly. Check the dog’s mouth for foreign objects that may be lodged there and, only if very easily accomplished without injury to yourself, remove them. Sedation is often necessary in these cases. If you can see thread, string, or another form of cord hanging from the dog’s mouth, do not pull it or cut it. Doing so may cause injury to the throat or esophagus, among other sensitive structures. In any case, take the dog to a vet as soon as possible. If the swallowed object is an acid, alkali, a petroleum product, or you’re not sure, do not induce vomiting. If the swallowed object is sharp, NEVER induce vomiting. In all cases, call your veterinarian immediately for advice as to the next steps required. These will vary depending on the object ingested, the time of ingestion and the symptoms the pet is currently exhibiting. A veterinarian will be able to perform tests and take X-rays if you are unsure of what the dog has swallowed. Barium studies, ultrasounds and CT scans are but a few of the tools available to determine whether surgery may be required to remove the object or not. Treating a dog that has accidentally swallowed an object can vary widely from simply plucking the object from the throat while sedated to intestinal surgery that may require the removal of several feet of bowel. The potential severity of a simple unchewed corn cob or tube sock cannot be underestimated. Although it’s almost impossible to stop dogs from putting things in their mouth, always be present and keep an eye on what they’re chewing. Avoid keeping too many toys as well as moisture-swollen chewsticks around your home. Human items, such as socks and underwear, can also be a danger for chew-prone dogs. Lastly, remove large pits from fruit and cut up food before serving it to a dog. Dogs love to go for car rides. For many dogs, their favorite words are “bye-bye”. I’ve seen dogs jump, prance, smile and bark with delight at the thought of a car ride. How many times have you seen dogs hanging out the car window? Or on the owners lap looking as happy as can be? Yes, going for a ride in the car can be fun, but driving with dogs can also be very dangerous to both you and your dog. I recently talked to some owners that were in an accident – caused by their dog – in which they were injured, the car they hit had some severe injuries and their dog was killed. How tragic! There are some very common dangers and causes of injuries that can be prevented – and if you understand them, it will help keep you and your dog safe. 2. Air and eye injuries – Some dogs that hang their head out of an open car window can obtain injures when things that are flying in the air hit their head or eyes. When these objects hit the dog’s eyes it can cause corneal ulcers and injuries. 3.Airbags – Dogs can be severely (even fatally) injured by airbag deployment. For this reason, many dog seats and harnesses are created for use in the back seat. 4.Distraction – Dogs distract drivers. I’ve seen excited dogs on their owner’s lap moving back and forth from the passenger window to the drivers’ window. For one reason or another, they distract their drivers causing an accident. The driver looks at their dog to see what they are doing and wham! 5.Slowed reaction time – With a dog on your lap, your ability to drive and react quickly is impaired. Drivers are often unable to make a quick turn with their dog on their lap. This is a common cause of accidents. 6.Injury in crashes – Pets can be severely injured in crashes and, when they are unrestrained, they can run out of the car and suffer even more injuries. Some have even run away. 7.Foot petal problems – Some dogs (and cats) love to get down by the floor, under the seat or near the foot petals. I’ve seen several cases where this caused crashes. Pets riding unrestrained in a vehicle may be cute and fun – until an accident happens. Less than 20% of dog owners use some sort of harness or seat belt to restrain their dog while in a car. Seatbelts and car seats are especially made to keep dogs safe. We recommend that all dogs be restrained in the back seat during car rides. All pets should have a microchip as well in case they get free during a car ride. Windows should be kept at a lowered point so the dog can get air but can not get their head completely out the window – thus preventing eye injuries and any risk of jumping. Is Rawhide Safe for Dogs? Chewing — it’s what dogs do. And rawhides are classic chew toys for dogs. Made from the inner layer of cowhides that are cleaned, cut, shaped, sometimes flavored and then dried, rawhides can give dogs hours of chewing pleasure. Or they can be gulped down practically whole bydogs who are more eager for the eatingexperience than the chewing experience. So when clients ask me if it’s safe to give their dogs rawhides, I have to say that it depends on the individual dog. Labrador Retrievers and Pit Bulls, for instance, tend to be heavy-duty chewers and gulpers. They are among the dogs who are most likely to bite off and swallow large pieces of rawhide. Those chunks can become stuck in the esophagus, stomach or intestinal tract and may pose a choking risk or require emergency surgery or endoscopic removal. Other dogs, though, may be content to gnaw on them for hours or days. That’s just one of the reasons why everyone, including veterinarians, has a different opinion on whether it’s okay to give your dog a rawhide. I asked two of my colleagues, Tony Johnson, DVM, and Tina Wismer, DVM, to weigh in with their experiences. There’s a small but real risk of a blockage if a dog swallows a piece of rawhide, says Dr. Johnson, an emergency and critical-care specialist in Indianapolis. “I have seen many esophageal foreign bodies in smaller dogs with rawhides,” he says. He’d rather not give rawhides to dogs at all. In his opinion, the ideal dog treat or toy should be either completely consumable in 30 seconds or as inedible and difficult to consume as possible. At home, though, his wife — who is also a veterinarian — gives rawhides to their three dogs with no problem. 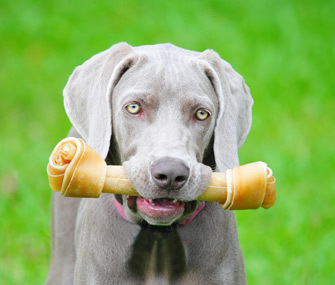 Some dogs break teeth when chewing rawhides. There’s a higher risk of that with pressed rawhides because they are more dense, Dr. Wismer says. The way rawhides are prepared can also be a concern. In the United States, rawhides are washed with degreasers and detergents, sterilized with hydrogen peroxide and then thoroughly rinsed. The hides are refrigerated until they are processed to keep them fresh. But rawhides made in other countries may be produced under less stringent practices. Dr. Wismer notes, however, that there has been only a single documented incident of imported rawhides contaminated with toxins. “This dates to the early 1980s, when there was one shipment of rawhides that was contaminated with arsenic,” she says. The Food and Drug Administration does not regulate the manufacture of rawhides in this country. It’s up to consumers to call U.S. manufacturers and ask about their practices. That’s a heck of a lot easier to do with a manufacturer in the U.S. than one in China. For that reason, I only recommend rawhide products made in the United States. Dr. Johnson also prefers domestically made rawhides. Don’t hesitate to call the manufacturer and ask if their rawhides are completely sourced and made in the U.S.
Like any product from an animal source, rawhides can also be contaminated with salmonella, says Dr. Wismer. The same is true for pig ears, cow ears and similar items, she adds. Salmonella typically affects younger dogs and those with compromised health, and healthy dogs tend to be less prone to salmonella infection than humans. But it can be an issue for people in the household who come in contact with the rawhide. Young children, seniors and people with compromised immune systems are most at risk. Don’t let little kids play with or chew on rawhides, not even long enough for you to snap a photo for Instagram. And wash your hands after giving your dog a rawhide or putting one away. So is there an upside to giving your dog a rawhide? There may be. Chewing a rawhide helps to keep dogs mentally stimulated and out of trouble. What about a rawhide’s rumored teeth-cleaning properties? Anything that rubs against the teeth can help, but letting a dog chew a rawhide is no substitute for daily tooth-brushing or a professional cleaning that gets under the gumline where bacteria lurk. What’s the verdict? For the vast majority of dogs, I’ve seen very few accidents from chewing rawhides other than digestive upset. If you choose to give your dog rawhide treats, know his chewing style, select one that’s large enough that he can’t swallow it whole and only provide it when you can monitor the chewing. If he’s a gulper, not a gnawer, keep an eye on him while he’s chewing to make sure he doesn’t break off and swallow pieces. Put the rawhide away when you can’t supervise. Chew on! Accidents happen. Your dog’s playful nature and curiosity may lead to cuts, scrapes, and punctures at some point in his life. Proper wound cleaning will prevent infection and help you and the vet tell how bad your pet’s injury really is. When you find that your dog has been injured, get immediate control of him, calming him down in case he is overwhelmed. Gently petting him and speaking to him in a calm, friendly voice, try to soothe him instill confidence that things are or will be okay. Although you may get so worried, do not show it to your dog. He is able to read your body language and he can tell what your voice intonations mean. He is likely to pick up on your behaviors and act following your lead. A calm dog has his heart not racing any more, and that may ease the bleeding. Whenever you are handling an injured animal, remember to keep your safety first. Even dogs that are usually sweet and friendly may lash out in fear of additional pain. As such, if you are not fully confident about your safety as the dog begins to growl and snap at you, or if he has a history of using his canines when irritated, muzzle him first. In case there is no muzzle, wrap a light rope or leash around his muzzle, and be keen not to block the nostrils. In case this initiates a big fuss, avoid any protraction and try the best to, as safely as you can, take him to a vet. To ensure you are safe, put a towel or blanket over him before and as you move him to the pet hospital. More than cleanliness, you should actually focus on stopping profuse bleeding immediately. If you find the blood is pulsing out of the fresh wound, it is likely your dog has an arterial vein injury, and that can turn out very disastrous. You ought to treat pulsing blood with the fierce urgency of now. Using a clean and absorbent material, apply pressure direct to the wound. For that matter, you can use a washcloth, towel, gauze, or a sanitary pad, even. Stay it there while the pressure is on for about 3 to five minutes, then check to confirm whether the bleeding has stopped. Do not let excitement make you keep on taking the pressure off and on again, for that will disrupt blood clot formation, delaying the process. When trying to control dog injury bleeding, using a tourniquet should be the last resort. Be aware that pick up on t if applied inappropriately it may result in complications leading to tissue death. It is scary that the pet might be given an amputation if you cut off proper circulation, and neither your dog nor you want that to ever happen. As such, if you had no proper training on how to apply a tourniquet to a fresh wound on a dog, you are advised to call your vet to receive professional instructions on how to it right. Don’t just rely on the written general guide. Place a clean pad or towel around his limb—not anywhere near his chest, neck, or abdomen. Using a leash or belt, hold the towel in place. The tourniquet should be place just above the wound, toward its body. Let it stay for between 5 and 10 minutes, and then release the pressure to avert permanent injury to his limb. Use just adequate pressure to alleviate or stop the bleeding, while avoiding too much that may result in crushed tissue or muscle. However, be confident while doing this; applying tourniquet should be painless to your faithful friend. Retractable Dog Leashes: Are They Dangerous? Once you have bought the items that’ll make your furry new family member feel welcome in your home—like beds, treats, and toys—it’s time to make decisions about practical things—like which leash you will use for walking with your canine companion. There are the traditional leather or nylon leashes, which come in enough colors and lengths to suit any pet owner’s style, and there are retractable leashes, which also come in a host of different styles to suit individual preferences. The main goal, however, should be to choose the safest leash for your dog. While it can be said that there are pet owners who are happy with their retractable leashes, before you make that final decision, consider the pros and cons of these devices. Some dog owners prefer using a retractable leash over a standard leash when walking their pup. For Josh Manheimer, a direct mail copywriter for J.C. Manheimer & Company in Vermont, using a retractable with his 2-year-old basset hound Stella makes sense so she can still explore all the smells she wants. “The benefits of extending leads are clearly that dogs can have more interesting walks and poorly trained dogs can still be prevented from running off and into danger,” says Dr. Roger Mugford, animal psychologist and CEO and founder of the Company of Animals. There are benefits for both the dog and the human walking them, says Phil Blizzard, CEO and founder of ThunderWorks, which makes a retractable ThunderLeash. In addition to exercise, Blizzard says a retractable leash allows the human to keep a steady pace while the dog can freely sniff things that interest them. The main drawbacks of retractable leashes revolve around training and safety. Blizzard realizes that retractable leashes can be a safety concern. To help this, the ThunderLeash comes with a booklet to help dog owners use it more safely. The ThunderLeash can also be arranged to be a “no-pull” leash, wrapping around the dog’s torso to discourage pulling, says Blizzard. Not all pets, or pet owners, are good candidates for retractable leashes. Veterinarians say they see a lot of injuries related to retractable leashes. “The most common are neck injuries, since a pet might start to run before the owner can lock the leash,” says Dr. Duffy Jones, DVM, of Peachtree Hills Animal Hospital in Georgia. “Many times the dogs have a full head of steam before the owner locks the leash, so it creates a good deal of force on their collar when the leash finally locks.” Reports of lacerated tracheas (windpipes) and spinal injuries are relatively common. Other injuries include dog fight injuries due to a dog being too far away for the owner to bring it back quickly enough, and although Jones says never treated a dog that’s been hit by car due to a retractable leash, he says it’s easy to see how such things can happen. And it’s not only pets that can be injured by a retractable leash, humans can be injured by getting wrapped up in a long leash and falling, Jones says. Mugford says that some of the safety issues with retractable leashes come because people don’t know how to use them properly. “Too often, people don’t get the hang of thumb controls, and they panic and lose control of the dog,” he says. “Owners reach forward to grab the line of the extending lead with their free hand and can then sustain nasty rope burns.” In one case that received attention a few years back, a woman had her index finger cut off by a retractable dog leash. It’s clear that leash manufacturers understand that retractable leashes come with safety concerns. Mugford’s company makes the HALTI Walking retractable lead, which he says alleviates the rope burn problem with soft tape. The company also takes safety into consideration with reflective thread in the leash and an ergonomic handle. Another retractable leash manufacturer, flexi, offers written directions and a video on their website so owners will better understand how to use retractable leashes. The directions cover possible safety issues like falls, face injuries, and finger amputations, and tells people how to avoid these dangers. Even if you’re committed to using a retractable leash while walking, you may want to reconsider it if you’re looking to train your dog, trainers say. If you want to train your dog for loose-leash walking but have been using a retractable leash with your dog, Milam says it’s harder to reverse the behavior. It’s also difficult to train other behaviors while using a retractable leash because the dog is so far away. She uses longer leashes for training sometimes, such as a 20-foot leash, but notes that she can make them shorter if necessary and isn’t relying on a button to do so, like on a retractable leash. Overall, there are clearly concerns about retractable leashes when it comes to both training and safety. If you have specific questions, talk to your veterinarian or trainer to see which option will work best for your dog. If you encounter a dog in need or injured in some way, your first reaction may be to run to help. That’s a common reaction – most people don’t want to see an animal in pain. But without taking the proper precautions, you could get injured. And being injured along with the animal won’t help the situation. It is important to remember that even the sweetest dog may bite if she is frightened or in pain. Here are some guidelines for approaching an injured pet. Use common sense: Remember that your safety comes first. If the dog is in the middle of the road, watch for traffic before going to assist. If there is a house fire, do not enter the house until the fire department has eliminated the danger – very likely firefighters will rescue the dog. If your dog has fallen, make sure no more items are ready to fall on you. If your dog is covered in a toxic substance, do not touch the animal unless you are wearing protective gloves or can cover him with plastic (or some other protective material). If your dog is covered in blood, do not touch the animal without protective gloves. Even though there are few diseases you can get from animal blood, there is no guarantee that human blood is not mixed in from someone else. That person’s blood may have spilled onto the animal, and with the threat of HIV, hepatitis or other illnesses, exposure to any blood is not recommended. If the animal shows signs of fear or aggression, muzzling him is essential before helping. As you approach the animal, pay attention to his body language and any sounds he is making. Use a soft, gentle, calming voice. Avoid direct eye contact with an injured pet since some will perceive this as a confrontation or threat. A wagging tail is irrelevant. Some dogs with wag their tails throughout an attack. Submissive behavior such as lying on ground with belly exposed (these dogs can quickly become fear-biters)Remember, keeping yourself safe and uninjured is just as important as helping the injured animal. You cannot be much help if you also need medical assistance.If the animal you are trying to help is aggressive and there is a risk that you may get injured, do not try to administer treatment. Call a local animal shelter, humane society, veterinary clinic, animal control officer or police department.Try to stay nearby to watch where the animal goes and to assist when help arrives. If necessary, direct traffic away from the injured animal until further help arrives. The Dangers of Lawn Chemicals: Are Lawn Pesticides Killing Your Pet? Pesticides accounted for more than 32 percent of lawn and garden supply sales in 2014. As Americans strive for the perfect green lawn, they are using a wide array of chemicals to achieve their goals. Unfortunately, this has a detrimental effect on the environment and the animals who live in it. But “animals” are not limited to wildlife. In fact, many pets are susceptible to falling ill as a result of exposure to lawn chemicals. Pet owners also happen to carry many pesticide chemicals with them, on clothes and shoes, as a result of regular exposure. Research has revealed that after pesticides are applied outdoors on lawns, they often make their way indoors and onto surfaces. How much exposure do cats and dogs experience when they are close to the ground on a regular basis? A study published in July 2013 looked at urine samples of dogs from 25 households to determine whether chemicals entered their systems after they were applied to lawns. Chemicals were detected in the urine of dogs from 19 of the 25 households examined following pesticide application. However, it’s worth noting that pets from 14 of the 25 households had chemicals in their urine prior to application. Wismer goes on to state that insecticides and snail bait tend to be the most poisonous to pets. Luckily, safer alternatives, such as pyrethrins, have been developed as of late. Some experts believe that it isn’t just insecticides that pose the biggest threat—herbicides and fertilizers can be just as dangerous. Disolfuton, for example, is a pesticide commonly used to protect roses. It’s extremely toxic to animals, causing everything from diarrhea to seizures. “With more pressure from pet owners, the large lawn care companies may be looking for ways to accommodate safety concerns,” said Dr. Avi Adulami of the Smiling Pets Veterinary Clinic in Florida. However, the key to improving safety may not just lie in the hands of fertilizer and pesticide manufacturers. There is plenty that pet owners can do to maintain their lush, green lawns while keeping their furry friends safe. “Most lawns need very few supplemental chemicals beyond nutrients applied in fertilizer products,” said Dr. Frank Rossi of Cornell University’s School of Integrative Plant Science. The dryness of pesticides on plants after application may also play a role in how they impact animals that come into contact with them. Rossi goes on to state that as pesticide and insecticide manufacturers move to make these chemicals safer for humans, they are inevitably becoming safer for animals, too. Of course, it helps for pet owners to be savvy about what they buy for their lawns. Warning labels on lawn care items may list specific hazards to animals, as well as precautionary statements. All of these warnings should be taken into consideration before using a product throughout a yard. Here in Southern California, we have a dreaded phenomenon known as the Santa Anas, when the normal wind pattern reverses and instead of a nice coastal offshore breeze, we get blistering dry winds pouring in from the desert. Most of us understand that this affects how we go about our day, and the intrepid make the necessary adjustments so they can continue their normal activities without problems. Unfortunately, there are a number of people who still fall short in the common sense department. I took my dog Brody for a hike yesterday, starting early because I knew the day was going to hit 80 degrees before noon. When we parked I saw a huge sign out front with a heat warning and a message for people to be sure to bring enough water for themselves as well as their pets. The park ranger told me it’s not uncommon for them to see at least several dogs a year die of heat stroke on the trails, which are remote enough where there is no easy access out other than the way you came in. And it’s tragic because it’s so preventable. Fortunately, the signs seem to be helping. On this hot day I saw plenty of dogs and people carrying lots of water. We stop at least every 30 minutes to let Brody drink, and he plops himself face first into the bowl with glee. We also picked a trail that curves around a lake, so halfway through he was able to take a dip and then enjoy the cooling evaporation process on the hike back. Because dogs don’t have sweat glands the way humans do, they are limited to panting as their major cooling effort. (They do have some sweat glands in their paws, though they are not the principal mechanism for cooling.) This, coupled with the insulation effect of their fur, means they are prime candidates for heat exhaustion, particularly if they haven’t been building up to longer walks—which is why the weekend warriors are the ones who so frequently run into trouble. Everyone should know the signs of heat exhaustion and impending dog heat stroke symptoms: sluggishness, very heavy panting, bright red gums, hypersalivation (which can progress to the opposite: dry tacky gums), vomiting or diarrhea, and collapse. In the later stages, death can occur rapidly if not treated in an ER. Certain dogs are especially prone to heat stroke: overweight pets, brachycephalic (flat faced) breeds like pugs and bulldogs, and dogs with dark coats. If you have any suspicion that your dog is showing early signs of heat exhaustion, stop, spray your pet with cool water (NOT ice! ), and call an ER for guidance. Of course, the best solution is to prevent it from happening in the first place by being aware of the risks. Avoid walks during the hottest periods of the day, acclimate your pet to longer walks, and make sure you take plenty of water breaks. And for goodness sake, don’t leave your pet in the car on a hot day. But you knew that one, right? Most dogs love going to the dog park. It’s a chance for them to roam around, play, and meet new furry, four-legged friends. Unfortunately, there are some dangers involved with dog parks. Here are 5 steps to better prepare you and your canine companion for the dog park. The dog park is a place to refine skills, not to expose dogs to discipline and social encounters for the first time. Respect others and have your dog undergo basic socialization and training classes before exposing him or her to others at the dog park. Basic training commands like sit, stay and heel are a necessity when dealing with a chaotic environment such as the dog park. You may even want to go the extra mile and have your dog certified as a Canine Good Citizen. Whenever dogs gather there is an inherent risk that contagious diseases may spread from one animal to another. Consult your veterinarian to determine which vaccines are appropriate for your dog and region — and be sure to keep them up to date, especially before going to places like the dog park. Often veterinarians will recommend administering core vaccines, which protect against deadly diseases like canine parvovirus, distemper virus, and rabies. Another important form of prevention for dogs planning to visit the dog park is the use of flea and tick preventives. There are many types to choose from — collars, spot-ons, oral medications, and more. Each type has its own method of application, onset of action, and duration of protection (some up to 12 weeks!). Ultimately, what’s most important is that your dog is protected with a flea and tick preventive before going to the park. Dogs often come into close contact with each other and with grasses, shrubs, and bushes at dog parks. This gives fleas and ticks the perfect opportunity to latch onto new hosts — in this case, your dog. Discuss with your veterinarian what flea and tick preventive is best for your dog and situation. Additionally, check your dog for fleas and ticks after every visit to the dog park. Dogs can get a little rambunctious and unpredictable when congregating in packs, so don’t assume you’ll be able to walk into the park, unleash your dog, and come back in 10-15 minutes. Your undivided attention is required in case an incident or emergency should present itself. That means no burying yourself on the cell phone screen! This is especially important if you’re bringing more than one dog to the dog park — though try to avoid managing more than two dogs by yourself. Instead, enlist the help of a friend or two and split up the dog-watching duties. If a medical emergency does arise, don’t be caught unprepared. Make a mental note of the nearest exit(s) and mark emergency numbers like your veterinarian’s office and nearest animal hospital on your phone for speed dial. Some offices and hospitals are open on weekends and holidays, while others are not. It’s best to know the hours of availability for your preferred facilities before your dog has an emergency. Every year, dogs suffer and die when their guardians make the mistake of leaving them in a parked car—even for “just a minute”—while they run an errand. Parked cars are deathtraps for dogs: On a 78-degree day, the temperature inside a parked car can soar to between 100 and 120 degrees in just minutes, and on a 90-degree day, the interior temperature can reach as high as 160 degrees in less than 10 minutes. If you see a dog left alone in a hot car, take down the car’s color, model, make, and license plate number. Have the owner paged in the nearest buildings, or call local humane authorities or police. Have someone keep an eye on the dog. Don’t leave the scene until the situation has been resolved. If the authorities are unresponsive or too slow and the dog’s life appears to be in imminent danger, find a witness (or several) who will back up your assessment, take steps to remove the suffering animal from the car, and then wait for authorities to arrive. Watch for heatstroke symptoms such as restlessness, excessive thirst, thick saliva, heavy panting, lethargy, lack of appetite, dark tongue, rapid heartbeat, fever, vomiting, bloody diarrhea, and lack of coordination. If a dog shows any of these symptoms, get him or her out of the heat, preferably into an air-conditioned vehicle, and then to a veterinarian immediately. If you are unable to transport the dog yourself, take him or her into an air-conditioned building if possible and call animal control: Tell them it is an emergency. Provide water to drink, and if possible spray the dog with a garden hose or immerse him or her in a tub of cool (but not iced) water for up to two minutes in order to lower the body temperature gradually. You can also place the dog in front of an electric fan. Applying cool, wet towels to the groin area, stomach, chest, and paws can also help. Be careful not to use ice or cold water, and don’t overcool the animal. PETA offers leaflets that can be placed on vehicles to remind people never to leave unattended animals inside. For information on ordering PETA’s “Don’t Let Your Dog Get Hot Under the Collar” leaflet, please click here. Simon Cowell stars in PETA’s public service announcement (PSA) informing viewers of the dangers of leaving dogs in hot cars. You can help spread the message by contacting us at ActionTeam@peta.org or 757-622-7382 for information on how to get the PSA aired on your local television stations.